Want to know three things I really love? I love organization. I love challenges. I love Pinterest. I even have a Get Organized board on Pinterest. It is chock full of tips to help become more organized. Despite my great love for organization, I am not organizationally inclined. I am the opposite, an organizationally reclined person. The first step on the road to recovery is admitting that you have a problem, right? Why would I share something so personal in such a public way? This has been quite difficult for me, but sharing helps strengthen my commitment and resolve to follow through and succeed. For years I have studied about organization. I have made valiant efforts to improve. It has been the subject of many fervent prayers. 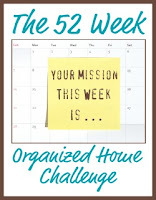 I found The 52 Week Organized Home Challenge on Pinterest and pinned it to the Get Organized board. The Challenge was created by Taylor Flanery, who describes herself as a wife, mom of 3, and former lawyer who is now a full-time WAHM (Work-At-Home Mom). She has incredible organizational talent and a good grasp of priorities. Could she help me? Was this an answer to prayers? I had to take the plunge and find out for myself. Each Monday I will put up a new challenge on the site that we will all work on during the week (including me -- I'm doing the challenge right along with you). You can just check the site each week for the new challenge if you want. However, I know that it can be hard to remember to check something on the web each week, so I am also going to send out the challenge each week as part of the free email updates and newsletter for the site. If you want these free emails to come to your home, along with additional organizational tips and hints, sign up below. Okay, pinning the Challenge on my board and registering online was easy. It required no real work or commitment. The next step was a big one. I had to actually get to work. That was intimidating. But how do you start? By following the 52 step program. Yes, it is a bit longer than the standard 12 step program. Baby steps, right? Taylor has made it achievable by breaking the process up into little, do-able sections. 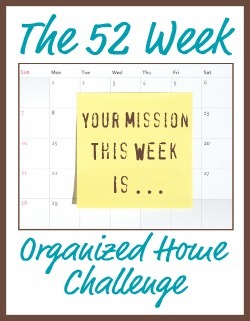 The first Weekly Challenge in the series is titled Week #1 Organized Home Challenge Kitchen Organization: Countertops & Sink . This is where the real work begins. Can I succeed? Would you like to join in the Challenge with me? If you do, please let me know. If you blog about it, I'll post links to your Challenge in my weekly updates. Hanna, I think that would be fantastic! Thanks! Love it! I am very organized, but the Holidays have left me a bit cluttered and overwhelmed. I am in on the challenge! Robin, that is wonderful news. If you like, send me updates and I will include them with future posts. It might help inspire someone. P.S. You just made my day!!! I stopped by this section to motivate me to get a "Life Schedule" made. I think seeing all goals that I would like to achieve on a list will help me stay focused. What is it about this time of year that makes me feel so out of control..lack of sunshine perhaps? Thanks for the inspiration Reecea!